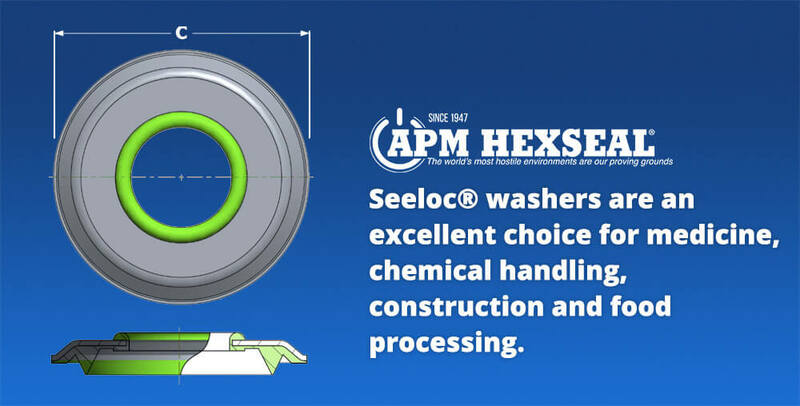 APM Hexseal Outdoes Itself Again with Seeloc® Washers » HHP Associates, Inc. In their quest to seal and protect every aspect of machinery, APM Hexseal occasionally decides to outdo themselves. Seeloc® washers are one such example. Seeloc washers can be used with screws, bolts, and studs to create a 360-degree sealing barrier around the periphery of the washer face. They’re also a great option for sealing optional knockout holes in control boxes. Hexseal also suggests their use in equipment for medicine, chemical handling, construction, and food processing. Seeloc washers are made of molded silicone rubber, which is bonded to specially formed stainless steel. This makes them reusable whenever maintenance and adjustment are needed. Seeloc washers are an extra measure–the company even refers to them as “a solution in search of a problem”–but that didn’t stop them from also releasing a heavy-duty line of the same product, which can withstand 50% more torque.